We have seen Clinton vs. Trump and now it is Le Pen vs. Macron in France. Last weekend France decided on the final presidential candidates and the race between them could not have been any closer. Le Pen and Macron just barely outdid their rivals and while we excitedly await the final round, we look at the competition in the News Boxes. As always, this analysis features a custom keyword set which you find below the text. The team of the News Dashboard will guide you first through the top 10 most visible publishers for both desktop and mobile – from the 22/04/2017 to the 24/04/2017 – and then show how the top 5 most visible publishers appear in the different positions of the mobile News Boxes for “Emmanuel Macron” and “Marine Le Pen“ during Election Day. And trust us when we say that some exciting things lie ahead of us. And now, first things first: top 10 publishers in the desktop News Boxes. 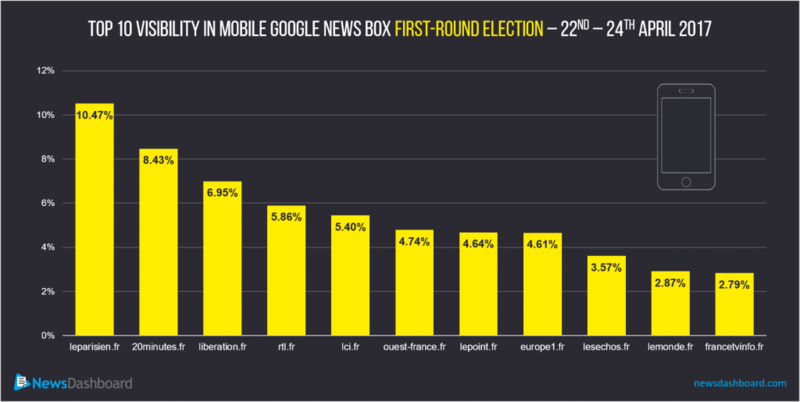 Lemonde.fr‘s visibility is by far the strongest one for election related keywords. Clearly, we see the big players for such an important topic in the top 10. But, surprisingly lemonde.fr is widely in front of the rest of the publishers with 11,53 percent. Right next to each other, on places 2 and 3 are 20minutes.fr with 7,05 percent visibility and francetvinfo.fr with a 0,68 percent lesser score. Leparisien.fr and lefigaro.fr come next with a score closer to 6 percent than to 5. The Huffingtonpost with its French edition also make the top 10 on 7th position with 4,85 percent. Still in the top 5, but just below the 4 percent mark are in descending order: europe1.fr, liberation.fr, lepoint.fr and ouest-france.fr. But most people will have followed the election on their mobile device, so this is what we will look at in the next part: top 10 publishers in the mobile News Boxes. 20minutes.fr is again on second position as one of the most visible publishers durng the French election. Leparisien.fr moves from fourth place to the front row with a whooping 10,47 percent. But, clearly the competition in the mobile department is much stronger than on desktop that means that 20minutes.fr is a mere 2,04 percent behind leparisien.fr. Liberation.fr also does much better in mobile than in desktop, they achieve third place with 6,95 percent. Just above 5 percent and right next to each other we have then rtl.fr and lci.fr – both only in the mobile top 10 and not part of the upper desktop scores. Next are familiar faces in the second half of the top 10: ouest-france.fr, lepoint.fr and europe1.fr. Not getting over the 4 percent hurdle are: lesechos.fr and to our big surprise lemonade.fr and francetvinfo.fr. Huffingtonpost.fr and lefigaro.fr are unfortunately not part of the mobile top 10 most visible publishers. Enough with the general keywords – let us now see the candidates in a close-up. The top publishers are the most visible during the afternoon hours for “Emmanuel Macron”. 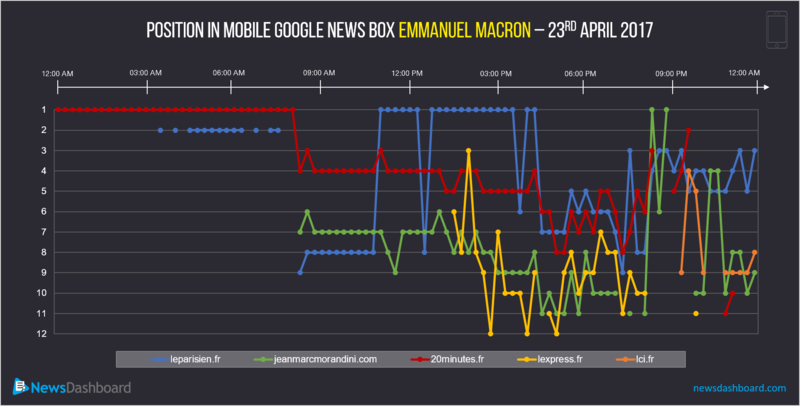 What you see here are the changing positions of the top 5 most visible publishers for the whole keyword set on Election Sunday in the mobile News Box (Carousels included) for the keyword “Emmanuel Macron”. A News Box is an ever-changing thing and a publisher’s goal is remaining as close as possible to position 1 throughout the whole day. For 20minutes.fr this works out fine in the morning, but after 8 am they slowly lose their pole position and drop out of the top 5 in the late afternoon, but they do recover towards night time, but drop out of the mobile News Box towards midnight. Leparisien.fr‘s performance is also not bad in the morning on second position, but after 8 am they suddenly drop down quite a bit in the ranks. But, they quickly recover and reach their prime time between 11 am and 5 pm. Throughout the evening and night they still stay relevant, but never make the pole position again. Jeanmarcmorandini.fr appears in the ranks just after 8 am and goes down from 6th position towards 11th in the afternoon. Between 8 and 9 pm they two times appear as the number one, but spend the night on lower ranks. Lexpress.fr gets part of the the visible news discussion around “Emmanuel Macron” at 1:34 am and gets lost at 8:04 pm. Lci.fr might be strong for mobile visibility on Election Day, but not so much for this candidate, they only appear in the News Box for approximately two hours and this at night. But we will not stop here, let us now look at the performance of these publishers for “Marine Le Pen“. 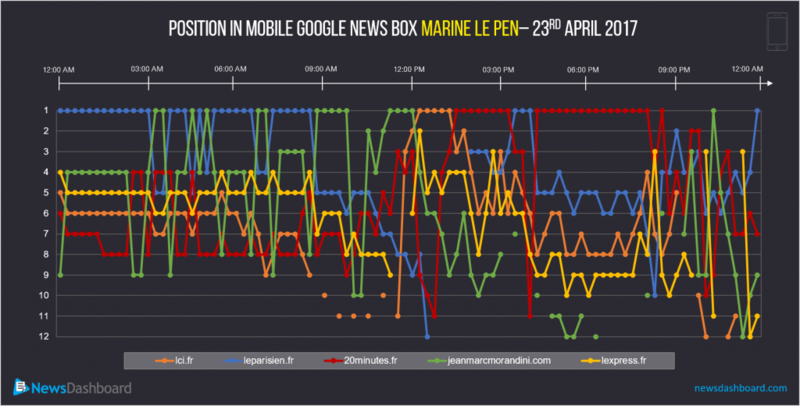 There is a high fluctuation in the News Box for “Marine Le Pen” on Election Sunday. First of all, we see a strong appearance of all top 5 publishers in the News Box for “Marine Le Pen” as a keyword throughout the whole day. Secondly – we see a lot of changes in the positions of this News Box and imagine this picture for all the involved publishers and not only the top 5 that would be quite overcrowded. Overall, we see until noon leparisien.fr and jeanmarcmorandini.fr on the first position. Although they also take place in the middle ground, it is more occupated by the rest of the top 5. In the afternoon 20minutes.fr becomes especially visible as the rest drop in their ability to hold the top positions. Jeanmarcmorandini.fr even leave the News Box for a few hours. In the late evening and night the positions in the News Box change a lot and the players quickly interchange their positions. Right, so what have we learned? We have some big French news publishers that perform hugely different in desktop and mobile. While 20minutes.fr hold up their place for both system, lemonde.fr and leparisien.fr for example score hugely different in these areas. And not only do the player positions change, the players also change in the top 10. 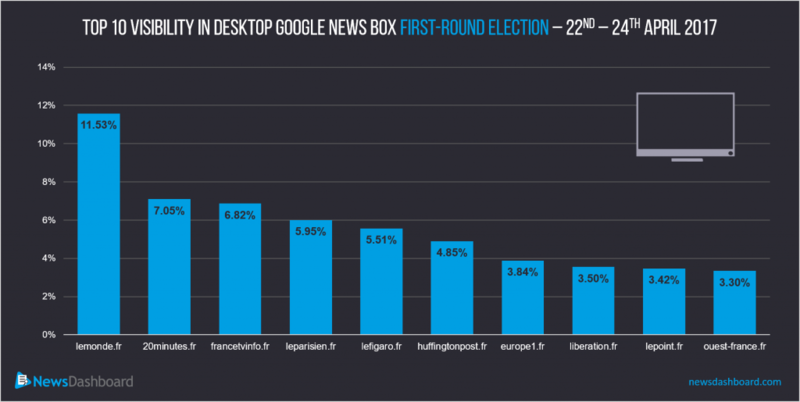 While huffingtonpost.fr and lefigaro.fr take part in the desktop News Boxes, rtl.fr and lci.fr are strong in the mobile News Boxes. For Election Sunday we have a change in the mobile News Boxes – here jeanmarcmorandini.fr and lexpress.fr are strongly visible next to the usuals: leparisien.fr, lci.fr and 20minutes.fr. Fluctuation wise we have a clearer competition for news regarding “Marine Le Pen” in comparison to “Emmanuel Macron”.